Looking like something straight out of a horror movie, the Ospedale Psichiatrico di Volterra is the crumbling husk of a mental institution that was closed due to cruel treatment of its patients, one of whom left a mysterious work of epic scale etched into the plaster of the walls that imprisoned him. The buildings that once housed the psychiatric hospital stand on a hill in a forested area near the center of the town of Volterra. After walking down what was once the asylum’s private street, one reaches the most recently constructed building (there are four structures in total). The building has been severely damaged by vandals; the windows have fallen in, and the outside walls are covered in spray-painted graffiti. Inside, there are still a few items that were left in 1978, the year the hospital was abandoned: wheelchairs, an old telephone booth, sun beds. The now-derelict hospital was founded in 1888 with the establishment of a ward for the demented in the poorhouse of the former convent of San Girolamo. In 1902, the ward was named Frenocomio (meaning psychiatric hospital) S. Girolamo, and in the following decades, under the direction of Dr. Luigi Scabia, after whom one of the buildings was named, the institution underwent significant development, expanding gradually with the creation of shops, services, an agricultural company, and a judicial section. Scabia’s plan was to build an independent village in which patients could feel free, but also to put into effect a plan of work tailored to each patient in order to direct their reinsertion into society after hospitalization—in 1933, shortly before his death, Scabia even established a currency for the inmates’ use. Between 1902 and 1909, many new patients arrived, and new pavilions—Verga, Charcot, and Ferri—were built to accommodate them. But Luigi Scabia retired in 1934 and died shortly thereafter, choosing to be buried in the institution’s cemetery along with the corpses of inmates unclaimed by their families. 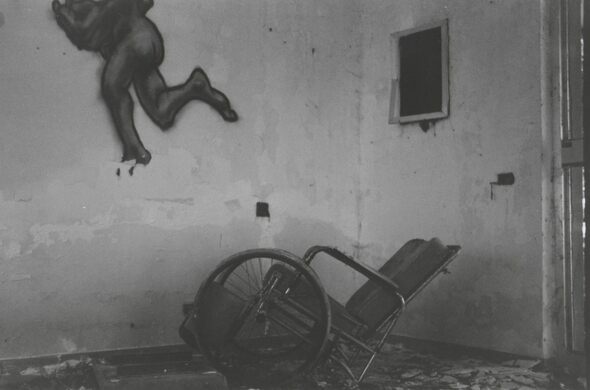 In the 1950s and ‘60s the hospital grew to become one of the largest asylums in Italy, with over 100,000 cubic meters of space, until Law 180 (also known as the Basaglia Law, after its architect, psychiatrist Franco Basaglia), mandating the closure of all mental hospitals and the regulation of compulsory medical treatments—and thus effectively instituting the Italian public mental-health system—was enacted in 1978. Currently, the former asylum’s physical plant is in a process of total surrender to the natural world. 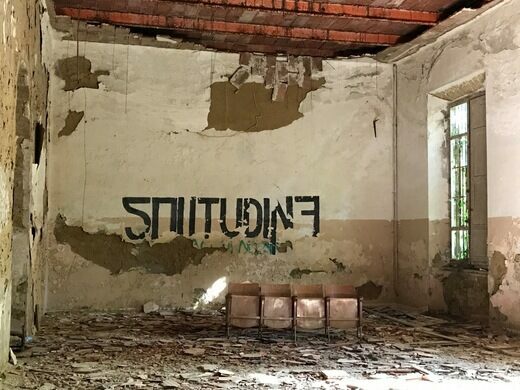 But since its closure, the hospital has become famous for the graffiti of Fernando Oreste Nannetti, also known as NOF4, NOF, or Nanof, as he preferred to sign his name. He carved 180 meters of an outer wall, recording during his many years of hospitalization an encyclopedia of feelings, biographies, and crimes both witnessed and suffered. Words, poems, and drawings were etched into the yellow plaster with the buckle of his vest, part of the uniform of the insane inmates. Airwaves, formulas, metals, stars, names, symbols, and cities: he scratched all these things and more into the plaster. Morning or afternoon, sun or rain, winter or summer—it didn’t matter. He worked around the heads of the catatonic patients sitting on the bench in front of the wall and dodged the wrath of the stringent nurses to cross space and time through his words and images. The courtyard where the patients took their daily walk was the only place within the hospital grounds where they could take in the sky and fresh air. Some played cards, while others conversed or smoked cigarette butts they’d scavenged, but on these outings Nannetti conspicuously kept to himself, never speaking to the others as he created his enormous oeuvre. He became the “astronautic colonel of of astral mining”, always working to expand the murals that became his dialog with the world. The Collection de l’Art Brut Lausanne considers Nannetti’s graffiti to be an example of art brut, opining that his writing is reminiscent of Etruscan inscriptions and reveals an imaginative world all his own. 20 years after its author’s death, the work was honored with a Civic Merit from the City of Volterra. The highest award went to Nannetti, an honor that has not touched thousands of inmates of the former mental hospital: being remembered. On March 21st, 1968, Nannetti, for the first time, left the asylum, brought, along with other patients, for a few hours to San Lazzaro, where they could stop in a park or buy a coffee. 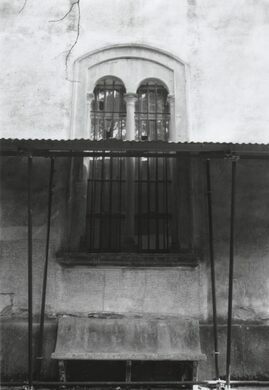 In 1973 Nannetti was moved to the Bianchi Institution, also in Volterra, and then a few years later to another hospital where he remained until his death in 1994. In addition to the exhibit and book produced by Collection de l’Art Brut Lausanne (and an art project entitled “Diversi Muri: Un Omaggio a NOF4 (Oreste Fernando Nannetti)” organized by the Swiss Institute of Rome, the hospital and Nannetti’s story have inspired the contemporary singer Simone Cristicchi to write the song “Ti regalerò una rosa”, whose lyrics form an imaginary letter written by a man who has been locked in a mental hospital since he was a child. Other works of art inspired by Nannetti include the short film “Ferdinand Knapp”, directed by Andrea Baldini, and the hour-long film “L’osservatorio nucleare del sig. Nanof”, directed by Paolo Rosa. Peiry, L. (2011). Nannetti’s soliloquy carved in stone. In L. Peiry (Ed. ), Nanetti(pp. 164-166). Gollion, Switzerland: Infolio Éditions. This abandoned orphanage-turned-asylum witnessed a terrible chapter in Québec's history.